As a native Atlantan, I have very fond memories of seeing Tom Mullica perform at his magic bar on Peachtree Street, The Tom Foolery. I am sad to report that today, we lost one of magic's great performers and a genuinely nice guy. When we recorded this, Tom had been battling leukemia, but it was in remission and Tom was preparing to renew his Red Skelton tribute show in Branson. There was recent talk about the opening of a new Tom Foolery on Las Vegas as well. I am so happy to have had the chance to share this moment with Tom and can only say that I am so sorry to not have had more time with him. Jim Steinmeyer & Mike Caveney rejoin me on the Magic Newswire's "Spirit of Magic" podcast to talk about several topics including magic snobbery, the 20th anniversary of the LA Magic History Conference which just wrapped in Los Angeles, their new release from Taschen Books, "Magic: 1400 - 1950", and their current projects including Steinmeyer's biography of Howard Thurston and Caveney's long anticipated "Magic of Mike Caveney." Magic creator, consultant, historian and author Jim Steinmeyer is our guest on this episode of the Magic Newswire podcast. In addition to talking about his magical youth, Jim shares his experiences working with some of the biggest names in magic. Doug Henning, David Copperfield, Lance Burton and Siegfried & Roy are just a few of the professional performers who have all turned to Jim for assistance over the years. In addition to writing a new work on Thurston and completing an oversized book on the history of magic with Mike Caveney, Jim is acting as the magic consultant for the new Ringling Brothers & Barnum and Bailey Circus tour "Zing Zang Zoom." This is the first of a two part interview. On this episode of the Magic Newswire's "Spirit of Magic" podcast we have a chat with Australia's honest conman and one of the hosts of the latest incarnation of The Real Hustle, Nicholas Johnson. The concept for the Real Hustle as a television program originated in the UK and has gone through several incarnations in various countries. Nicholas is a con artist, magician, speaker & comedian who uses sleight of hand, card cheating, pickpocketing & psychology to recreate the world of the professional con man. As we approach the 100th anniversary celebration of the mansion that serves as the permanent resident for the Academy of Magical Arts, we continue to explore the rich history of the Magic Castle. My guest on this episode of the podcast is George Seigel. George is the architectural historian for the Castle and the man that knows the complete history of the mansion. How many people have died in the Castle? Are there any reports of paranormal activity? Is there a connection between the family that lived there when it was a private residence and Harry Houdini? An insane asylum!? All this and more will be revealed on the Spirit of Magic Podcast! The public, the press and his peers have recognized David as one of the world’s foremost sleight-of-hand artists. In Dai Vernon: A Biography (2006), David penned the first half (part two being in production) of the definitive portrait of Dai Vernon, the most influential magician of the twentieth century. He is the co-founder and Artistic Director of Magicana, a performing arts organization and registered charity which serves to educate and increase the public’s understanding and appreciation of the art of magic. David joins me on the podcast to talk about his love of magic and his contribution to Genii's 75th Anniversary sauluteto the Jinx. Bob Wallace, retired CIA Director of the Department of Technical Services is one of the co-authors of the new book,The Official CIA Manual of Trickery and Deception. In 1953, against the backdrop of the Cold War, the CIA initiated a top-secret program, code-named MKULTRA, to counter Soviet mind-control and interrogation techniques. Realizing that clandestine officers might need to covertly deploy newly developed pills, potions, and powders against the adversary, the CIA hired America's most famous magician, John Mulholland, to write two manuals on sleight of hand and undercover communication techniques. In 1973, virtually all documents related to MKULTRA were destroyed. Mulholland's manuals were thought to be among themuntil a single surviving copy of each, complete with illustrations, was recently discovered in the agency's archives. The manuals reprinted in this work represent the only known complete copy of Mulholland's instructions for CIA officers on the magician's art of deception and secret communication. Bob joins me on the podcast to talk about the book that Lance Burton describes as, "A legendary lost piece of magic history. It's James Bond meets Harry Houdini!" Just before heading off to the 2009 MindVention in Las Vegas Alain Nu joins me on the Spirit of Magic podcast. Alain is “the man who knows, ” a mentalist and mystery performer who explores the hidden potential of our minds. Join Alain and me as we discuss modern mentalism and the ways in which he entertains even the most skeptical audiences with the awesome powers of the mind. Alain will be presenting a special metal bending seminar on Saturday and lecturing during the main convention. Shawn Farquhar returns to the Magic Newswire's "Spirit of Magic" podcast to share his FISM experience with our listeners. As you will know, Shawn was awarded First Place in Cards and went on to with the Grand Prix in close-up at the event in Beijing. We talk about both the good and the bad of this year's FISM. Shawn also discusses the controversy that his victory stirred up within magic circles and about how this impacted him on a personal level. He also shares the story of how his "Shape of My Heart" routine was created. Jeff Hobson is one of the most in-demand comedy magicians working today. His refreshing and clever mix of comedy and magic has brought him back for repeat performances all over the world. Hobson has won numerous awards for his skills. Among the most recent is his Best Comedy Magic award given by the International Magic Awards Association as well as an award of Best Magic Review by the World Magic Awards for his role as star and producer of the critically acclaimed Carnival of Wonders with Kalin & Jinger. The founder of the Magic Castle and the producer of the annual "It's Magic" show is my guest on this special edition of the Magic Newswire's Spirit of Magic Podcast as we explore the history of the Castle which celebrates it's 100th anniversary next week. In the podcast, Milt shares his experiences as the founder of one of the most magical places on Earth, talks about what the future holds for the Magic Castle and promotes the 100th Anniversary celebration "It's Magic Show" which takes place next week. The Misfit of Magic is a fitting title for magician, comedian and actor Ed Alonzo. Ed was named "Best Comedy Illusionist" on the 2008 World Magic Awards and is a featured performer on Episode 3 of Masters of Illusion. Ed began his career in magic as a member of both the Long Beach Mystics and the Junior program of the Magic Castle. Ed Alonzo won the coveted "Stage Magician of the Year" for two consecutive years, and "Comedy Magician of the Year" for another two consecutive years from the internationally recognized Academy of Magical Arts. Ed's unique blend of vaudvilian comedy and such bizarrely staged illusions as "Great Rack" and the "Invisible Baby Elephant" make Ed a truly unique character. In Part Two of my interview with the legendary Jon Racherbaumer, we explore the many influences on Jon and his passion for magic. Marlo, Vernon, Cardini, Slydini, Chan Canasta, Channing Pollock, Tommy Wonder, John Scarne and more all enter into the conversation. In addition, we discuss 75th anniversary edition of the Jinx that he and Harry Anderson have put together for the October issue of Genii Magazine. Barrie Richardson may be one of magic's most soft spoken thinkers, but he has contributed a great deal to the art of magic an mentalism. With the 1990 release of "Theater of the Mind," Barrie became instantly synonymous with great mentalism. The release of his second book "Act II" continued his legacy. Barrie joins me on the Magic Newswire "Spirit of Magic" podcast to talk about his influences in magic including Ted Annemann whose JINX magazine will be celebrated in the October issue of Genii Magazine. Joining me from Budapest, Hungary is the newly dubbed World Champion of Stage Magic, Soma! Soma has become widely recognized in magic circles over the last several years after winning the such awards as the Golden Lion and the Magic Rings Grand Prix. After being named the Champion in the General Magic category at this year's FISM in Beijing, China Soma went on to win one of the most prestigious awards in the world of magic, the FISM Grand Prix for stage magic. His original phone-act, has been recognized for its originality and has been featured at conventions and gala shows around the world. In this Magic Conversation, Soma discusses the evolution of his magic and shares his FISM experience with our listeners. Who was the stunt double that did the backflips for John Belushi in the movie "The Blues Brothers?" Who grew up in Harry Anderson's garage? Which magician overcame the hardships of dyslexia, ADD, severe speech impediments and other learning disabilities to become a world renowned magic performer? You've probably guessed that I am talking about Jonathan Pendragon by now. (Did the title of this article and the picture to the left give it away? ) Named by Magic Magazine, as one of 10 living magicians whose work shaped magic in the 20th and 21st centuries, Jonathan Pendragon is my guest on this episode of The Magic Newswire's "Spirit of Magic Podcast." When we posted the first part of our interview with Jonathan, we talked about the challenges that he had to overcome in order to become one of the top magicians in the world. It is no secret that the Pendragons are facing a new set of challengesas I post these interviews. In this episode, Jonathan talks in detail about meeting and romancing Charlotte and how they became one of the most respected couples in magic. Named by Magic Magazine, as one of 10 living magicians whose work shaped magic in the 20th and 21st centuries, Jonathan Pendragon is my guest on this episode of The Magic Newswire's "Spirit of Magic Podcast." After many years of writing magic books Stephen Minch decided to found his own publishing house which he called Hermetic Press. Today, the Hermetic Press is one of the most prestigeous magic publishers in the world and Stephen is considered one of the best editors and authors of magic books. Also recognized for his encyclopedic knowledge of magic history. Mr. Minch joins me on the Magic Newswire's Spirit of magic to talk about Ted Annemann and the Jinx. On Friday, September 11th, 2009, our friend magician Eric DeCamps was invested as a Dean of the Society of American Magicians Parent Assembly #1. Eric has been performing for more than 30 years. Among his many honors, he was voted Magician of the Year by The Society of American Magicians and is only the second person in the 107 year history of the organization to receive the prestigious Gold Medal of Excellence for Close Up Magic. Eric joins me on this episode of the Spirit of Magic Podcast to reflect upon the most recent honor bestowed upon him by the organization and what it means to him as he moves forward in his magical career. Eric will be performing his one man show at the Magic Castle on September 27th. Nathan Burton returns to the Magic Newswire's Spirit of Magic podcast after his appearance on the current season of America's Got Talent. Nathan was also a contestant on the first season of the show in which he placed 11th. Nathan returns to a show which seems more receptive to magic acts than it has been in the past. In addition to discussing the why and how of his return to the America's Got Talent stage, he offers his opinions on how to succeed as a magician on one of the most popular television shows in the world. In addition, Nathan talks about Michael Jackson and his love of magic as well as a photograph of MJ which has surfaced showing the King of Pop in attendance at Burton's show with his children. Doc Eason is known today as one of the premier bar and close-up magicians in the Magic. Most recently, Doc was honored by the Academy of Magical Arts at their 41st annual awards ceremony where he was named "Close-up Magician of the Year." This was not Doc's first award from the AMA as he was named WC Fields' Bar Magician of the Year in 2005. Know for his long run at John Denver's Tower Restaurant in Snowmass, Colorado, Doc began his career in magic at the age of 30 when he met Bob Sheets. Bob became his longtime friend and mentor helping to shape Doc as the magician that he is today. Doc talks about his time with Bob and JC Wagner as well as talks about working on the television show "Masters of illusion." We continue to celebrate making it to our 100th episode of the Magic Newswire's "Spirit of Magic" podcast with Part 2 of our chat with Master Magician Lance Burton. In this segment, Lance talks a bit more about people like Channing Pollock , Johnny Thompson and others that have impacted his career. In addition, we joke about his reaction to the Masked Magician television shows and discuss the impact that the next generation of magicians can have upon our art. Lance is one of the top performers in Las Vegas with a $27 Million dollar venue built just for him at the Monte Carlo Resort & Casino. In July of 1980, he became the first magician to win magic's most coveted "Gold Medal Award for Excellence" from the International Brotherhood of Magicians. Two years later, Lance received magic's highest accolade when he won the Grand Prix at the Federation International Society de Magic (F.I.S.M.) in Lausanne, Switzerland making him a "World Champion Magician." If you don't know the name of Jon Racherbaumer, you should either walk away from magic or take some time to explore his influence on our art form. Jon is one of those guys that managed to connect to some of the greatests names in the modern history of magic including Ed Marlo, Eddie Fields, Orson Welles, and Senator Crandall. Given the controversies surrounding Blackpool & FISM 2010, it is also interesting to note that he was at one time blackballed by both the IBM & the SAM. Please join us for Part One of our interview with Jon Racherbaumer and learn more about lesbian bowlers, the "Magic Mafia" and how a good magician becomes controversial. As discussed in our interview with Robert Wallace regarding the recent release of the manual that John Mulholland producedunder contract for the CIA, I thought it only appropriate to explore this topic further. In this episode, we talk to Ben Robinson, the author of the only biography of this individual,MagiCIAn : The Secret Life of John Mulholland. John Mulholland became a consultant to the newly born CIA in 1953. His assignments included working with billionaires and inventors, cracking codes and delving into the clandestine world of ESP research, LSD use and the secret MK-ULTRA world headed by the notorious Dr. Sidney Gottlieb. During this period, CIA Dr. Frank Olson died the day after Thanksgiving, 1953. This book examines Mulholland’s role during this dramatic period in the CIA’s history and goes against the current trend of accusing Mulholland as having a role in Olson’s fatal fall from a hotel window. Enjoy exploring the fasinating topic with the Magic Newswire. Welcome to the launch of a new addition to the MagicNewswire.com podcast lineup. When I first began podcasting on the subject of magic, it was just me and a microphone talking about the news of the week. I quickly grew bored and the interview concept that you now know as the "Spirit of Magic Podcast" was born. This is a return to the magic news discussion that started it all, but in the form of a roundtable discussion. I've recruited a number of friends from the magic community to participate in a rotating roster of co-hosts and will include a "Mystery Guest" in the show that they are not aware of until we start recording. On this episode, Jim Callahan is the Mystery Guest and Scott Wells joins Cameron Ramsay as my co-hosts. We discuss Jim's recent interview on the "Spirit of Magic," marketing magic in today's economy and discuss the exposure of secrets in all its' forms. On the second episode of "This Week in Magic" Scott Wells, Cameron Ramsay and I are joined by special guest, Brian Brushwood. During last weeks show with guest Jim Callahan, one of the topics discussed was exposure and Jim expressed the opinion that Brian was essentially exposing the secrets of magic and mentalist on his Revision 3 podcast "Scam School." This week, Brian joins us to offer his thoughts on this topic and to explore the many ways that a magician can market their act in the college market. One of the most controversial figures in mentalism joins me on this episode of the Magic Newswire "Spirit of Magic" podcast. Why is Jim such a debated personality? Does he actually claim to possess supernatural powers that allow him to speak with the dead or is he simply misunderstood as a performer? Has he actually applied to participate in the James Randi Educational Foundation Million Dollar Challenge or is it all just a scam? We talk about all of these topics and much more in this episode and look forward to your questions and comments to be discussed in a future conversation with Jim. On this episode of the Magic Newswire Spirit of Magic podcast I am thrilled to be joined by the ultimate "Underground Magician." For more than 50 years, Sol Stone has been referred to as "the magician's magician." In May of this year, Sol was named "Magician of the Year" by the Parent Assembly of the Society of American Magicians, Assembly #1 in NYC. Sol is best known as a coin magician, teacher and mentor to generatons of performers. Join David Roth, Jeff McBride, myself and other guests for this fascinating conversation. You will hear tales of Howard Thurston, Dai Vernon, Flosso, Paul le Paul, Jerry Openheimer, Ed Balducci, Tarbell, Gene Huggard, Slydini and many more! John Carney is no ordinary magician. John is a performer, creator, writer and philosopher when it comes to the art of magic and has received more awards from the Magic Castle than anyone else in their long history. Carney talks with us about his evolution as a performer and what it takes to be a truly good student of magic. His mentors included "The Professor" (Dai Vernon), Faucett Ross and many more legendary figures from the history of our craft. Carney's "Book of Secrets" is being re-released as well as a new DVD series that he developed with Jim Steinmeyer. My guest on this episode is an entertainer considered by many to be the foremost Mentalist performing in the English language, Richard Osterlind. In addition to his many and varied performing credits, Richard is also the creator of several landmark effects of mentalism and has just released the much anticipated six DVD set on Corinda's Thirteen Steps to Mentalism in which Richard performs dynamic effects from each step of Corinda's seminal work in front of a live audience. Previous Magic Newswire podcast guest Max Maven returns to discuss his decision to resign as the Entertainment Director of the Magic Castle. As this information began to circulate on the Interwebs, I thought it best to call&nbsp; Max in order to allow him to tell out listeners what the real story was before too many rumors began to circulate. In addition, he talks about this expereince booking acts for one of the most unusual clubs in the world. Max Maven makes a return appearance as my guest on this episode of the Spirit of Magic Podcast. Why has the first place prize for mentalism not been awarded at FISM since 1985 and then, not for eighteen years before that? Can mentalism even be successfully performed within the framework of a FISM competition? These are just a few of the topics that we touch on in this interview with one of our favorite mystery performers. Magic Cafe founder Steve Books joins me on this episode of the Spirit of Magic podcast. We discuss his early days in magic, the founding of the Magic Cafe website in the very early days of the internet and the many challenges and issues that he's had to deal with as they site has evolved over the years. In addition, we also discuss the launch of the new Tenyo Elite series of magic tricks and how that project came about. Chase Goforth, Scott Wells, Cameron Ramsay and I are joined on this episode of This Week in Magic podcast by magic creator, author and all around nice guy Jim Steinmeyer. Jim helps us to explore the creative process of illusion design and also discusses a few of the many consulting projects that he has been involved in for companies like Walt Disney and the Ringling Brothers Barnum and Bailey Circus. He also shares a few stories on how some of his creations have been abused and overused. Join us now for a fantastic conversation with Jim Steinmeyer! As America's Premier Corporate Presentainer Paul Gertner has performed for more than 500 corporations in more than 20 different countries, has lectured at MIT and has been featured on the front page of the Wall Street Journal... twice. 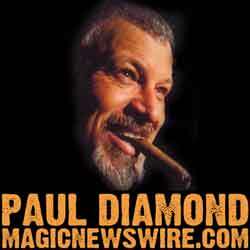 A frequent guest on the Tonight Show Paul has also appeared on NBC's World's Greatest Magic, HBO, That's Incredible! In 1998 he wrote and starred in the critically acclaimed one-man theatrical production... "Paul Gertner-Ten Fingers." Now he's reached the pinnacle of his career by being a guest on the Magic Newswire's "Spirit of Magic" podcast. Joanie Spina is our special guest on this episode of the podcast. If you're not yet familiar with Joanie, she acts as a performance coach to magicians, jugglers, dancers, singers, clowns, mimes, and actors. She offers a variety of services including theatrical direction, staging and/or choreography, individual performance coaching and promotional tape design and is best known to many as the co-director and choreographer for world renowned magician David Copperfield. If your demo tape does more traveling than you do, then sit back and enjoy the expert opinions of a master magic coach on This Week in Magic! Premier night has come and gone, the first episode has aired, and we say goodbye to Carnie Wilson and her Magic Coach Simon Lovell. Former con man turned magician, Simon Lovell, is the star of the longest running one man show off Broadway "Strange and Unusual Unusual Hobbies" at the Soho Playhouse. He is the author of numerous instructional works and DVD's on magic as well as his book for lay audiences, "How to Cheat At Anything." We were very please to present an interview with Simon in which he discusses his time on VH1's latest show, "Celebracadabra." Previous Magic Newswire guest, magician and expert on the art of the con Simon Lovell pays a visit to the Magic Newswire for a special edition of the Magic Newscast. During this chat, Simon takes a moment to help us remember Earl "Presto" Johnson as a part of our ongoing memorial to this influential underground magician. Simon shares his memories, impressions and opinions on the magician that he had to meet simply because he was mentioned in the biography of infamous comedian Lenny Bruce. Simon will also be a guest on the first ever iTricks"Live Clinic" tonight at 9 PM EDT. With only hours to go before David Blaine's "Dive of Death" is set to air on ABC, David took time to speak with us by phone. David talked about the medical breaks that many have referred to by some as cheating, his medical condition, his readiness for the final stunt and what moment is his favorite in the broadcast. Because of the live speech by the President at 9PM, the special will air in its' entirety on ABC from 9:15 - 11:15. As I begin the next season of the Magic Newswire's "Spirit of Magic" podcast, it is a pleasure to introduce you to the Master in Residence of the Conjuring Arts Research Center, the amazing David Roth. In this first in an ongoing series of conversations, David will discuss a wide array of topics including the relevance of magic with coins at a time where the quarter is the largest coin that most Americans will be familiar with. Dai Vernon's circumcission, the Spaghetti Sessions, the El Cerrito Seven and so much more. Bob Cassidy is a founding member of the Psychic Entertainers' Association and one of the most colorful and influential creators of modern mentalism. His book, "The Art of Mentalism" was immediately recognized as a classic in the field when it was released and remains at the top of the "must read" book lists of the leading practioners in this area of magic. In this interview, Bob shares his thoughts on the state of modern mentalism and discusses the influence of Ted Annemann and "The Jinx" on the art. Bob is also one of the contributors to the October special supplement to Genii Magazine which celebrates the 75th anniversary of the Jinx. In addition to his duties as an executive on the Board of Directors of several multi-national corporations, Marvin Miller has managed to find time to write more than twenty best selling books for children and to make a significant contribution to the art of magic and mentalism. Most recently, Marvin contributed the article "When Ted Went Postal" to Genii Magazine's 75th Anniversary salute to Ted Annemann's the Jinx. Join us on this episode of the Spirit of Magic podcast for a conversation that also touches on Walter Gibson, Dunninger, Himber and modern mentalism. Johnny Thompson and Pamela Hayes are best know within the world of magic as The Great Tomsoni &amp; Co.&nbsp; Johnny is widely recognized as one of the great thinkers in magic today. In spite of that, he and Pam still decided to have some fun chatting with us on This Week in Magic. Pam tells us what it is like working with the Adonis of the Las Vegas Showroon and Johnny shares the experience of tearing off Pam's dress with our resident cougar hunter.&nbsp; In addition, I was totally surprised to learn that one of Johnny's teachers in High School was an magician that you should all know.&nbsp; Johnny also channels Dai Vernon for a few great stories! On the 337th episode of the Spirit of Magic Podcast, I am thrilled and honored to welcome Howard Hamburg to the Magic Newswire family. Have you ever wanted to spend and hour or so with Dai Vernon,Michael Skinner, Larry Jennings, Charlie Miller, JC Wagner, Tony Giorgio, Francis Carlyle or any of the legends of magic that preceded this generation? If so, I am more than happy to get you one step closer o that goal by bringing you this interview with Howard. You are about to hear stories about many of the people that we idolize in magic today from an underground card magician that was an intimate of them all. As we launch this episode, I am also very happy to announce that the Magic Newswire's "Spirit of Magic" podcast has now exceeded Two Million Downloads since we first began tracking such things in March of 2008. Thank you so much for this endorsement of what I do. When I first began recording these conversations, I never imagined where it would take me and I cannot that you, the listeners, enough for the emails, donations and downloads. I more than justifies this small contribution to our art that I make by producing these interviews. Again, from the bottom of my heart, I thank you. Wayne Houchin has been creating magic since trying to duplicate the illusions of David Copperfield with cardboard boxes in his family's living room. He went on to stage a straight jacket escape while hanging from a crane in order to promote his first series of shows at the age of sixteen. In 2003, an underground tape of Wayne's original magic was seen by acclaimed mentalist Banachek who immediately recognized Wayne's potential. While consulting for the first season of Criss Angel : Mindfreak, Banachek suggested that Wayne be brough on to assist in the production of several of his original effects. In 2007 Houchin, Jonathan Bayme, Chris Kenner, B.J. Bueno, and Dana Hocking formerd Theory 11, a new online entity devoted to the advancement of the art of magic. Today, Wayne is releasing his latest project, "The Art of Magic" as a DVD or online download. Wayne joins us on the Magic Newswire's Spirit of Magic podcast to discuss his philosophy and thoughts on magic today. Seconds, bottoms, the pass, Malini, Vernon and so much more. Charlie Miller is one of those name tossed around in the context of modern magic that I feel most f the community knows too little about. I hope that this conversation with some of his closest friends does something to rectify that. Our good friend Johnny Thompson is joined by two other legends in magic, Harry Riser and Bob White. In July of 2008 I was thrilled to have the chance to record an interview with Richard "The Cheat" Turner. While updating the links to the entire podcast archive, I realized that I had never posted the promised second part of that conversation. Fortunately, I had it in my backup and I am able to rectify that error by posting Part 2 of my Interview with the amazing Richard Turner! Enjoy! In this episode of the Magic Newswire's "Sprit of Magic Podcast" I am thrilled to welcome the only pupil of the legendary Walter Irving Scott known in the magic and gambling communities as The Phantom. Scott is the focus of the book that Gazzo collaborated on with David Britland entitled "Phantoms at the Card Table: Confessions of a cardsharp" . Beyond his career as a street magician, Gazzo is an expert on cons and scams and was Scott's only pupil. He was also the only person with whom Scott entrusted his biography and life's work at card cheating and sleights. In this episode of the Magic Newswire's "Spirit of Magic" podcats, we talk to two of the featured performers, and the director of the new documentary film "The Magic Life." "The Magic Life" chronicles the journey of three magician hopefuls: a 17-year-old from Beijing who travels to the U.S. to attend magic school, a 25-year-old trying to make rent by performing on Hollywood Blvd for tips, and a 32-year-old New York University MBA graduate who moves to Los Angeles to perform at the world famous Magic Castle. The film depicts the challenges of following an unconventional career path. Forget about parents, family, or friends who may not understand or support your choices – there’s almost an invisible societal pressure in terms of what types of jobs are acceptable. “The Magic Life” is about those who are willing to risk everything to take the road not normally taken. Sometimes the risk pays off, sometimes it doesn’t. David Blaine joined us by phone on Day Two of his Dive of Death challenge for a quick chat to discuss his mentah and physical state. An obviously exhausted Blaine expressed his appreciation for the fans that been on site to show their support. Blaine's "Dive of Death" culminates on Wednesday Night at 9PM in a special that promises more magic than has been seen in recent shows. He also promises something amazing as the culmination of the endurance feat in Central Park. If you subscribe to the Magic Newswire Podcasts via iTunes or via our RSS feed, then you were the first to receive our latest show featuring Underground Magician, magic creator and magic consultant Daniel Garcia. As a consultant to David Blaine and a creator of many of the effects so hotly discussed within our art today, Daniel Garcia has a lot to say. What did he think of the final product after seeing the recent David Blaine "Dive of Death" special in which he was so intimately involved? What is his opinion on the major online magic retailers? What inspires his creative process? All this an more in our interview with Danny Garcia on the Magic Newswire's 60th episode! As the Executive Producer of the television series Masters of Illusion, the wife of renowned performer Harry Blackston Jr. and former President of the Aacademy of Magical Arts at the Magic Castle, Gay Blackstone knows her way around the world of magic. Gay joins us on this episode of the "Spirit of Magic" podcast to talk about working wither her famous husband, celebrity magicians such as Orson Welles and Neil Patrick Harris, the challenges that she's faced in putting together a thirteeen episode series for television and about shows that reveal the secrets of our craft. Maven joins us again on the Magic Newswire to discuss his personal history in the art of magic, further experiences with Dai Vernon and other legendary figures from the worl of magic, his recovery from the Celebraca-Hangover and his upcoming appearance at SEAM 2008 in Atlanta beginning on August 21st. The "Millionaires' Magician" joins us on the Magic Newswire after appearing on the cover of current issue of Genii Magazine. Performing in the Duke and Duchess of Windsor's Royal Suiteat the Waldorf Astoria Hotel in New York City, Steve Cohen presents an intimate evening of magical entertainment in the tradition of such legendary performers as Max Malini, Johann Nepomuk Hofzinser and Robert Houdin. Join us on the Magic Newswire for our interview with Chamber Magic's Steve Cohen! The New Yorker recently connected with an individual that they identify as "the most feared intellectual in the world of magic," Jamy Ian Swiss. Read "The Real Work" abstract from the New Yorker HERE. In the second part of his interview on MagicNewswire.com, Jamy mentions a controversial article that he published in Antimony #9 entitled "In Search of Street Magic." READ IT HERE Then listen to our conversation with Jamy. The New Yorker recently connected with an individual that they identify as "the most feared intellectual in the world of magic," Jamy Ian Swiss. Read "The Real Work" abstract from the New Yorker HERE. In the second part of his interview on MagicNewswire.com, Jamy mentions a controversial article that he published in Antimony #9 entitled "In Search of Street Magic. "READ IT HERE Then listen to our conversation with Jamy. Todd Robbins a.k.a. "The Coney Island Wonder Worker" joins us on the Magic Newswire's Spirit of Magic podcast for a chat about his experiences at the Magic Castle, why side shows are important and magic in general. Richard "The Cheat" Turner is a member of the Magic Castle Hall of Fame, a winner of the Golden Lion Award and a man that both Dai Vernon and Charlie Miller respected for his ability to "get the money." What most people that see him perform do not know is that Richard is blind. Join us on this episode of The Magic Newswire's "Spirit of Magic" podcast for a conversation with on of the top card manipulators alive today, Richard "the Cheat" Turner. Chris Capehart, featured on the cover of the December 2008 issue of Genii Magazine, talks with us about starting out as a street performer on Broadway in New York City. From his days competing with Jeff Sheridan to hanging out at the Governor Cafeteria with Slydini, Dia Vernon, Derek Dingle and David Roth, Chris's story is very unique among those shared with us as a part of our "Spirit of Magic" podcast. Chris is a regular headliner at the famous Monday Night Magic in New York City as well as at the Magic Castle. Many have dubbed Chris "The Ring Master" for his unique handling of the linking rings which was published in volume 13 of "Stars of Magic." My guest on this episode of the "Spirit of Magic" Podcast is none other than Techno Magician Marco Tempest. Marco believes that the magician’s role is to be the one who makes dreams real first, before technology can get there…and so Tempest is always out there exploring new frontiers, one step ahead of the rest of us. It’s hard to tell if he’s on a fool’s journey…or that of a true visionary. Perhaps it’s a bit of both. In this conversation, Marco and I explore the connections between magic and technology as well as what motivates him to explore new frontiers. Paul Daniels, arguably the best known magician in the UK is our guest on this episode of the "Spirit of Magic" podcast. Paul has been performing magic since he was eleven years old. He starred in his own television series "Its Magic" for more than sixteen years and was awarded Golden Rose of Montreux Award at the International TV Festival in Switzerland in 1985. In 1983, paul became the first magician from outside the US to be named "Magician of the Year" by the Academy of Magical Arts. Paul still tours with his magic show, and recently presented a intimate show focused on the ‘Magic of Max Malini’. Several previous guests from the Magic Newswire's "Spirit of Magic" podcast re-join us to talk about their contributions to the Genii 75h Anniversary Special Edition of the Jinx. Our guests on this episode include Mac King, Max Maven, Mike Caveney, Jonathan Levit and Eugene Burger. We talk to each of these performers about their contributions to the Jinx special edition and about how Anneman and the Jinx impacted their growth as practitioners in the art of magic and mentalism. Magic Magazine's March coverboy is "a man of the streets, a busker bringing magic to the people. He’s a videographer, bringing DVDs to magicians. He’s Kozmo, a man of the moment." Kozmo joins me on this episode of the Spirit of Magic podcast to explore what it means to be a street magician in an environment when everyone markets their products as if they were designed specifically for his customers. How has "Street Magic" changed since the appearance of David Blaine? Who are really the top street magicians performing today and do we know their names? All these questions and more are answered when I talk to the one and only Kozmo! Mike Caveney calls in from the world headquarters of Magic Words to join us for a chat on this episode of the Magic Newswire "Spirit of Magic" podcast. Mike began his career working at Owen's Magic Supreme, as a member of the Long Islan Mystics, turning coins for Johnson Products and performing at the Magic Castle. Not too shabby for a guy just turning 21 at the time. Mike talks with us about what made the Mystics different from most magic clubs, the importance of innovation and creativity in an act and shares the evolution of his signature effects. In addition, we learn a bit more about his role in the Left Handed League, the Bubonic Players and Wenii Magazine. Award-winning magician and world-renowned sleight of hand artist, Eric DeCamps joins us on the Magic Newswire "Spirit of Magic" Podcast before appearing as a featured performer at the SAM's 100th anniversary Salute to Magic! Eric has been performing for more than 30 years and was voted Magician of the Year by The Society of American Magicians. He is the second person in the 107 year history of the organization to receive the prestigious Gold Medal of Excellence for Close Up Magic. Join Eric and me to discuss his background in the craft and his upcoming appearance at the SAM's anniversary show. Harry Lorayne has appeared numerous times on every national television talk show in the United States as well as on innumerable programs throughout the world. He has had feature articles written about him and his work in most major publications and newspapers including, but not limited to, Fortune, US News & World Report, Reader’s Digest, Cosmopolitan, Ladies Home Journal, Christian Science Monitor, Gentleman’s Quarterly, Nations Business. He has even been called "The Yoda of Memory Training" by Time magazine. As if that were not enough, Harry Lorayne was named as one of the 100 most influential magicians of the century in 1999 by Magic Magazine. Join us on this edition of the Magic Newswire for our conversation with magician Harry Lorayne. Lorayne wrote and published the magazine Apocalypse for twenty years (later republished in books). His latest book for magicians is Lorayne: The Classic Collection, an updated collection of his first four magic books of the 1960s, and recently he completed Mathematical Wizardry—magic with numbers. In Part Two of my interview with the legendary Jon Racherbaumer, we explore the many influenences on Jon and his passion for magic. Marlo, Vernon, Cardini, Slydini, Chan Canasta, Channing Pollock, Tommy Wonder, John Scarne and more all enter into the conversation. In addition, we discuss 75th anniversary edition of the Jinx that he and Harry Anderson have put together for the October issue of Genii Magazine. Widely credited as the man who was the first magician to mainstream magic on television, Mr. Mark Wilson is our guest on ths edition of the Magic Newswire's "Spirit of Magic" podcast. This is the first of a multi-part interview that we'll be producing with Mark's help exploring his career, thoughts, ideas an philosophies as they relate to magic, both on television and on stage. If you were to describe the worst audience for a comedy magic show, would it beat the one that Mac King found himself facing? If you have a line that you put into your act only to get a laugh, what would you do if it came true? Mac King shares his adventures on the comedy magic stage with us on this episode of the Magic Newswire Spirit of Magic podcast and we discuss all of these scenarios and more. We even learn that Teller is a far better heckler than I will ever be.. no surprise there though. We celebrate our 100th episode of the MagicNewswire.com 's Spirit of Magic podcast with Master Magician Lance Burton. Lance is one of the top performers in Las Vegas with a $27 Million doallr venue built just for him at the Monte Carlo Resort &amp; Casino. In July of 1980, barely three months after his 20th birthday, he became the first person to win magic's most coveted "Gold Medal Award for Excellence" from the International Brotherhood of Magicians and received magic's highest accolade two years later when he won the Grand Prix at the Federation International Society de Magic (F.I.S.M.) in Lausanne, Switzerland making him a "World Champion Magician." This made Lance both the first American to receive this honor as well as the first American performer to do so. Johnny Carson called Lance's performance on his show the "Best 12 minutes in magic." Who was Fletcher the Flamboyant? How did he inspire Lance? Lance joins us to discuss these and many other questions related to his career and the many influences that have helped to shape his magic. Johnny "The Great Tomsoni" Thompson is our guest on this episode of the Magic Newswire's Spirit of Magic Podcast. Johnny is much more than an extremely well respected performer and one of the funniest magicians performing today. He is also a much sought after magic consultant and has worked for such performers as Lance Burton, Penn & Teller and Criss Angel. In addition to talking about his career, Johnny talks about other performers including Herb Zarrow, Jay Marshall, Marshal Brodein, Francis Carlyle, Paul le Paul, Paul Rosini, Joe Bergen, Cardini, Channing Pollock, Carl Balentine, Al Koran, Dai Vernon and Charlie Miller. Beginning at 8:30 am EST on Monday Morning, David Blaine will be hoisted feet first above Central Park's Wollman Rink where he will hang upside down for sixty hours. The end of this endurance stunt, the subject of which has been hinted at but not revealed, will be the finale of his latest ABC special "Dive of Death" which will air at 9PM EST on ABC. I was invited to participate in a teleconference with David today during which he and his medical consultant discussed the challenges and dangers to David as he attempts this feat. David also discussed the experience of filming this special, his inspirations and the challenges that he will face over the course of the next week. Join us now on the Magic Newswire for our conversation with David Blaine! "International Man of Mystery" David Berglas is my guest on this episode of the Magic Newswire's "Spirit of Magic" podcast. In his 2009 Enigma show brochure, Derren Brown describes David Berglas as "One of our greatest living magical performers" and thanks him "-for his constant inspiration and generosity. Each show is indebted to his artistry and astonishing body of work. Thank you David". Known within the magic community for his many creations, Berglas is best known for the effect named for him which allows for the prediction of Any Card at Any Number." David was the first elected President of London's Magic Circle and has had the opportunity to perform for England's Royal Family, Winston Churchill and Paul Getty.